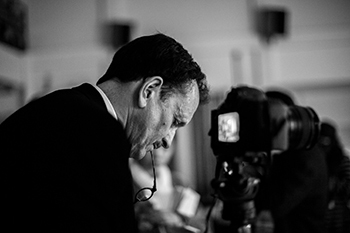 Photographer Gregory Heisler teaches students at Newhouse. A few decades ago—when darkrooms and Kodachrome were staples of professional photography—a “hotshot” photographer spoke at the Rochester Institute of Technology about his extremely successful career. In the audience sat an eager young college student who worked up enough courage to ask the first question: What advice would he give students seeking to build a similar career? Do something else, the photographer told students; photography is dead. That impressionable young student was professor and photographer Gregory Heisler. And lucky for countless admirers of his profound body of work—and now the Newhouse School—Heisler did not take those words to heart. His love of photography was just too great, Heisler says, and he forged ahead, building a career that is widely admired and celebrated today. And since fall 2014, that legend and rock star has called Newhouse home as a Distinguished Professor of photography teaching both graduate and undergraduate photography students his beloved craft. Visit the Newhouse School and chances are good you’ll see Heisler teaching, but not necessarily in the classroom or even the studio. When you do see him—on the sidewalk, outside on the Newhouse patio or out on the Quad—you will observe three things: his unique personal style (dark hat with an upturned brim, round tortoiseshell eyeglasses and a bowtie); his constant, energetic motion as he glides from behind the camera to his students and their cameras, and back again; and his body language, which oozes energy and enthusiasm about taking pictures. Bottom line: the guy loves teaching. And it shows. “You can see it in the photos his students produce. There’s some chemistry there, some magic in what they produce after he’s done with them. It comes out of their fingers. It comes out of their photos,” says MPD department colleague Mike Davis. And no wonder as Heisler has shot more than 70 covers for Time magazine and his work has appeared in countless other publications. His book “Gregory Heisler: 50 Portraits” includes photos he’s taken of this century’s luminaries, from athletes (Muhammad Ali) to musicians (Bruce Springsteen) to politicians (Hillary Rodham Clinton) and more. So why would a photographer at the top of his game put the brakes on his own phenomenal career to come and teach at Newhouse? So at the end of the summer of 2014 Heisler and his fiancée moved to Syracuse from Western Massachusetts, where he’d been working part time as a professor at the Hallmark Institute of Photography. During his first two weeks here, Heisler bought a historic house in DeWitt, got married and started at Newhouse. Talk with Heisler about what and how he teaches, however, and you won’t hear phrases like “good pictures” or “bad technique.” Instead he sounds more akin to a coach or even a yoga teacher. “(Students) have to bring something to the party but it’s my job to get them very excited and super duper interested and curious and make them want to work twice as hard as they’ve ever worked before,” he says. Sure, Heisler is working to ensure his students understand how to use their cameras—and how to create and control light—but more importantly, he wants them to be inspired by their photos. Their pictures should communicate a message, both from the photographer and from the subject. The work should tell a story, not just look good, he says. Heisler says he wants his students to love photography. If they love it, everything else has the potential to fall into place, he says. “You have to be passionate about it,” he says. “And you have to work at it. You can’t do ‘a little’ Olympic running. You have to do it every day. Serena [Williams] plays [tennis] all the time. She practices all the time. It takes that kind of effort. Second-year photography graduate student Alec Erlebacher was in one of Heisler’s first classes in the fall of 2014. He worked as Heisler’s teaching assistant for a class last summer and is a student in his class again this semester. “He doesn’t want us to make great pictures, he wants us to survive in life, doing what we love,” Erlebacher says. “He puts in far more hours than people are even aware,” Erlebacher says, noting how Heisler’s classes often include additional one-on-one lab and critique time. And Heisler’s office, on the top floor of Newhouse 1, decorated in bright orange carpeting, classic cameras and historic photos of and by Heisler favorites, is a revolving door of students seeking his help and advice. Heisler says he has tried to expose students to what the real world will be like after graduation. He encourages students to focus on what they love, and that making a living will follow. “It’s a little surprising how worried the students are about what’s next,” he says. For that reason, Heisler has opened his Rolodex for students. He has arranged for many field trips to New York City to meet with prominent photographers, and students say he’s a wealth of knowledge and networking. And that photography advice Heisler received as an impressionable college student so many years ago still resonates. It’s why he tells students just the opposite: keep at it, keep working, photography is very much alive and well. Heisler’s position on the Newhouse faculty is no accident. Strong, who runs the MPD department, was a student of Heisler’s at the first-ever Eddie Adams Workshop nearly 30 years ago. He describes Heisler as one of his photographic heroes and says he worked for several years to bring him to Newhouse. Strong’s hope that one of his earliest teachers would inspire a new generation of photographers is proving true. “When I tell people, photographers, that Gregory Heisler is one of my professors, they either want to go to this school immediately or their jaw just drops and they say how the hell is he teaching there,” Erlebacher says. What makes Heisler’s presence at Newhouse so important, says Strong, is not even his resume. To know Heisler is to know his amazing photography and now, his passion for teaching. But those who really know him also note his fun, goofy personality. During one of his first visits to Heisler’s office, Erlebacher says he asked his professor about a tiny camera on one of the shelves. Erlebacher asked how the camera could even hold film and Heisler encouraged him to pick it up and examine it more closely. “He’s super funny. He’s fun, he’s funny, he brightens up the room,” Strong says. So how long will Heisler—who remains one of the most important photographers working today—continue to brighten Newhouse?